I first met Aimee over a deskside at the old Conde Nast offices in Times Square when I was a 21-year-old beauty assistant at Glamour Magazine, and she a budding pr agency owner. Truth be told, I don’t remember those desksides very well, but she does! Apparently I was very straight-faced in demeanor and never featured her brands’ products (I don’t remember this and it certainly wasn’t intentional!) Then, ironically, while I was working as a marketing associate at a fun, home gifts start-up, the company hired her as their publicist, and our paths crossed again. We worked on many campaigns together there, and even did desksides together. I grew very fond of Aimee—her kindness, gregarious stories, and even more gregarious style drew me in and we became fast friends. When I created Nomaterra Fragrances, Aimee generously guided me in my outreach to editors until I could hire her as my publicist. Much of what I know and how I practice pr now, I learned from Aimee. She’s humble yet damn good at what she does, so much so that she has clients who stay with her for 5 years+, something unheard of in our industry. Last March, over gluten-free chocolate cookies at Maison Kayser, I offered my help to Aimee with desksides for her brands, and the rest is history. Now, Aimee and I partner on some brands together, crafting forward-thinking influencer and ambassador campaigns, blowing up pop-up launch parties in Soho, and modernizing media outreach—we have an absolute blast working together. 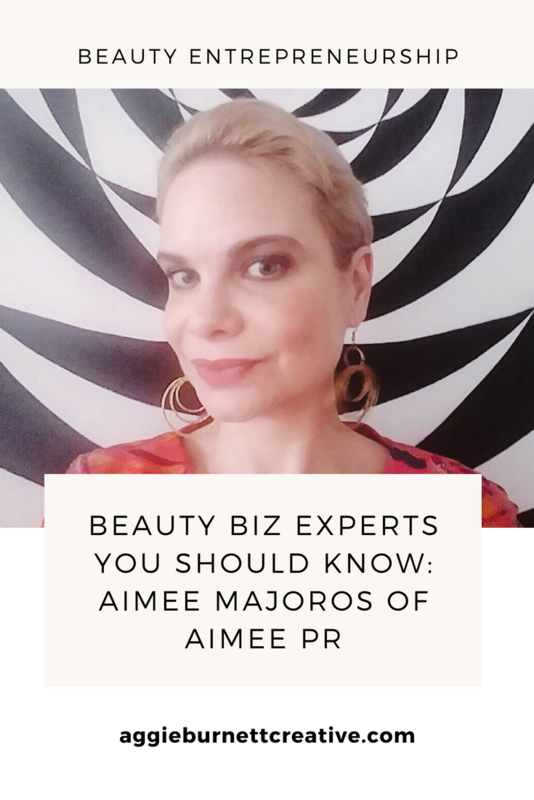 Aimee’s pr days started at Estee Lauder and L’Oreal, working on brands like La Mer and Aramis, and since launching Aimee Majoros PR, she’s helped make brands like One Love Organics, Kahina Giving Beauty, and Parfums de Marly household names in the beauty world. Even if you’re not a beauty entrepreneur, you’ll enjoy the captivating interview below—Aimee shares her tips on getting into Vogue, when her calligraphy skills saved a DKNY fragrance launch, and the 11 products she can’t live without (yes, there’s that many!). 1. How did you get started in pr? We had this internal elevator and I often rode the elevator to deliver things to other floors, and I kept running into this really stylish woman. We would always talk about random stuff. Then one day, I got a call from HR, saying someone requested me for an interview for a job in the PR department. The PR department was impossible to get into then, I had asked about it and HR had told me I needed agency experience first, but then this happened. I went up for the interview, and there was my friend from the elevator!! She didn’t even interview me, she basically said she knew I could do the job already. So that’s how I started. I was the exception to the rule. The department head told me that she was excited about me because I was going to “make the department cool”. I was much more weird looking then and I am shocked that they let me into a corporation like that, but I learned that being authentic is the most important thing in PR. I guess they knew that. If you are weird, be weird, you show everyone who you really are. It makes people see that they can trust you, media especially. 2. What did your day to day look like then? It was a very diverse job. I could spend the day doing work at my desk or be on a photoshoot. There was always lots of writing – the first press release I was ever assigned to write was on Aramis 24 Hour Deodorant. I thought “my boss hates me” – she was actually snickering as she walked away. How do you make deodorant sound cool? I had a lot of fun with it, I gave it a sort of “James Bond” action star theme. I still have it. I still think it was one of the best things I have ever written for a product launch. The coolest thing I ever did at that first job was help with the A&E biography on Estee Lauder, but really, it was all fabulous and very glamorous. When I worked at L’Oreal a few years later, I would sometimes have three lunches a day. I would just set up camp at Cipriani or some high end restaurant and the editors would come in and out. We’d taste everything. Such fun. I have made many friends that are beauty editors. The beauty industry in general is a wonderful community of people. 3. What does your day to day look like now? It’s also pretty diverse. I can be sitting at my desk writing or answering emails, or out meeting with clients and press. I try to attend a lot of industry events when I can. I would say I’m not out and about as much since a lot of things are accomplished via digital means – which does make me kind of sad. Being in business for yourself means a lot more grunt work than I was used to in corporate life, but it really doesn’t bother me. I kind of like packing boxes and bags. I have people I work with, but I don’t like to ask another person to do anything I can easily do myself. Perhaps I have a tiny problem delegating. I like to be hands on in all aspects of this job – something you actually don’t get to do when you work for a big company. 4. What was the most exciting brand or product you worked on? Why? I loved working on La Mer…I mean, getting to slather myself with La Mer was already amazing. I worked in international PR, and I got to interface with people from all over the world. They would often bring journalists and executives from different countries over visit headquarters and we’d give them extravagant brand themed gifts – one was an embroidered pillow in a big box with the jar of La Mer placed in the center of the pillow, so special. There were themed dinners, everything was just so beautiful. And so organized! My boss then used army time to map out the events. I could have easily joined the military after having this job. One of my favorite jobs while working on La Mer was to accompany editors from top international magazines on tours of the plant to see how La Mer was made. We’d take a limo out there. I’d take the editor to lunch. It was super fun and I kept in touch with many of them for years. The beauty editor at Italian Vogue would always tell me I should work for Stila because I looked like the girls in the little drawings they did on their packaging then. Kahina Giving Beauty is another – I met the founder 10 years ago. She wanted to give back to women in Morocco. Not only was the brand in its infancy but the whole green beauty and indie beauty industry was too. We were talking to people about face oils and people were all “You mean put oil? On my FACE? ?” Of course now this is a part of the beauty lexicon. And it is exciting to see how much Kahina has done over the years in terms of accomplishing their giving back mission. They have done so much more than I ever imagined. I am so proud to work with this company. Their products also happen to be amazing, I love them! I have so many funny stories, but without including anyone else (I have secrets on top of secrets, believe me!! ), one of the craziest things happened very early in my career. I was asked to help with the launch of DKNY the fragrance for men. They were hosting this lunch for the most interesting men in New York, I can’t recall the venue, it was The Four Seasons or some other venerable business lunch place. Peggy Siegal had been hired to help with the launch. Peggy Siegal, for those who aren’t familiar, is an absolute icon, a true power publicist. As people were walking in, another girl would tell me who they were, and I would quickly make up their cards under the table on my lap and welcome them as calmly as I could. You would never have known, I had taken a calligraphy class years before so I wasn’t too bad. I was seriously worried about Liev Schreiber’s name but I spelled it correctly. I always keep a fancy pen with me at events, even now. 6. How has pr changed since you first started? What do you like most about how it’s changed? What do you miss? I find that the traditional media (print and online) are less interested in personal connections than the bloggers. They want the info, it doesn’t matter if you went to their wedding and have been friends for 100 years. They want to “get in and get out.” They are busier than ever and I do miss all the breakfasts and lunches and fun times. The good thing is that bloggers seem to like forming personal relationships that are lasting, spending time talking. I talk to people on insta about random stuff. And yes, the traditional media are way better at asking for a specific need, I think because they work on a well established calendar and there is more planning involved. They know that they will do sunscreen stories in June, July and August each and every year, Fall fragrance roundups in September etc. I feel like with bloggers they are more open to you giving them ideas. The traditional media will respond less to an idea I throw out there. Often the idea I throw at them will interest them but they don’t often use it, they come up with something else. Both are nice to work with in different ways. 7. What has been the best advice anyone’s given you? I worked at Ralph Lauren for a short time before getting into beauty and they made us watch this film at our orientation. The film was all about shifting paradigms, and how it was so important to keep on top of changes in the way people do business. I pride myself on this, and it has come in especially handy with the ever changing media landscape. If a brand comes to me for example and says they don’t want to work with influencers, I tell them what a bad idea that is. It isn’t just about getting your product in magazines anymore, even online magazines – of course people still want that, but there is so much more out there now that is important! One of our clients actually asked “how do you make PR modern?” – and making PR modern means changing with the times. You can’t rest on your laurels or do things the same old ways as you did years ago. One thing that is very hard to explain to clients is that a press release is an outdated tool. We do need them if anyone is interested in featuring a brand, but you don’t need to lead with it. I also find that the way people do business overall has really changed. People were more “hard sell” in the past, which is something I have never been any good at. Recently at an event I was approached by someone who after introducing herself went immediately into trying to sell her services, and I was totally turned off. I kind of wanted to tell her that this is a very old fashioned way of doing business. Now people want to start a relationship with you, and if you vibe, maybe you will work together. I like to develop relationships with both clients and media. I have a client that has been with me for 12 years, and a lot of them do stick around for years, and have become friends. I love it. 8. What does your morning routine look like? Most days I’m up before work to go to the gym. I eat breakfast first, usually eggs and a little oatmeal plus black coffee. I eat tons of food! I started weight training a few years ago and I love it. I have to move, that’s my therapy It sets me up for the day. When I get back home I shower, cleanse with my Kahina Oil Cleanser followed by Dr. Dennis Gross Alpha Beta Peel Pads, a face oil (these days it is Kahina Argan Oil), my Sahajan Eye Cream and sunscreen. I never, ever go without sunscreen, I am religious. Even for the gym I splash water on my face and on goes the sunscreen. Then I put on makeup, which I do every day regardless of what I am doing. I often joke that I won’t even answer the phone without makeup! Every day, even if I don’t have any meetings, I dress as if I’m going to an office. It makes me feel really good. I’d like to say I haven’t checked emails before 9am, but that would be lying. It’s usually the first thing I do when I wake up. I try to write any pitches and press materials in the mornings as well as work on my plans for the clients after responding to emails and putting out any fires. I’m very “on it” in the morning. I was never a morning person but I trained myself. 9. What is the best advice you’d give to a beauty entrepreneur just starting out who wants to be in Vogue? The first thing I’d say to a beauty founder who wants to be in Vogue, or any other media outlet for that matter, is to read Vogue. See what types of stories they write and the types of things they feature. Don’t think you know what Vogue is all about, really delve into a few issues. It is important to get a feel for what a magazine/website/blog etc. is about, what their distinct point of view is. Then look for an angle – the part of your story or your product line that suits their particular point of view. Being a PR person, I would tell you that the best way to reach the media is to hire a PR person or firm – and you don’t always need a big firm, often a freelancer on their own can be a good fit. It is really advantageous to have someone who knows how to speak to the media in the way they like to be spoken to, to have someone who they know already and reach out to as a resource. However, if you are not ready for that financially, I would advise holding off on hiring someone. Of course you can do some research on social media and find out who the correct person to talk to is – and make sure it is the right person. If you have a lipstick line, that is for the beauty department, not the accessories editor because your lipstick comes in a beautiful case that you see as “an accessory.” I can’t tell you how many times beauty brands ask me to pitch their product as a fashion accessory, or a fashion brand asks us to pitch their sunglasses as a beauty product because they are worn on the face. It just isn’t that complex. And when you find the right person, email them just to be safe. Don’t message them on insta as not everyone is ok being approached that way, people will tell you if they are okay with that, their preferred method of contact later on. Don’t do what an old client of mine did before she hired us – she sent a message via the personal Facebook pages of the key editors she wanted to reach. Of course that didn’t work for her. Your pitch should be clear and concise – they will ask for more information and you can send it later in the form of a press release etc. The honest truth is that press releases are a pretty outdated tool when it comes to pitching. It is good to have a release in your back pocket when the editor asks for more information, but I never lead with a release. You can google to find examples of press releases – check on the websites of brands in your same space, often people will post them in an online press room. I like to include a link to a brand’s website and possibly a picture embedded right in the email if I’m pitching a product – or if its a brand founder, I’ll include her headshot too. Never send attachments right off the bat – only if they ask for more info. Keep your emails under 2MB so you don’t clog up people’s inboxes. 10. What has been the coolest pr/marketing campaign you’ve seen done successfully by a brand? Fenty Beauty has done a fantastic, fantastic job. Kudos to their marketing and PR teams. They did such a great job, I don’t even have to go into detail, do I? I also think Sunday Riley did a great job. They started working with micro influencers and that was a smart strategy. Microinfluencers are often overlooked even now. My clients will often question working with them, they ask for “bigger” influencers with larger followings – until we get going with microinfluencers. They do so much for a brand. I like to work with great people who are really doing a good job with their social and their blogs too – if they have good engagement and are a fit for a brand, they can really move the needle. And you never know – these people can grow their base like wildfire. I recently had a blogger who is now huge thank me for being one of the first to take a chance on him. This guy had under 10K followers and two weeks later, 30K. He’s in the hundreds now. 11. Are there any apps or online tools you love to use that make your job easier? I use QuickBooks online for invoicing and record keeping. My husband works with us and he handles that end, but I can understand it too. It streamlines the invoicing, I also use Cision, which is super helpful, Burelles to track press hits. Neither of these are 100 percent reliable, you still have to make double sure the contacts are correct and that Burelles is capturing all the placements, but they do most of the work for you. I love the Texture app for reading magazines and pulling screenshots of clips. HARO is helpful too. I am also part of several Facebook groups where PR people and journalists exchange information, which are absolutely great. I have gotten a lot of placements for clients through these groups and met a lot of fantastic people too. 11. Are you high maintenance or low maintenance? What are your top 10 favorite beauty products right now? Let’s not call it high maintenance, let’s just say that I’m VERY into self care. In other words, it’s hard to pick 10 products! Kahina Giving Beauty Oil Cleanser – my skin is very sensitive and acne prone, and since I incorporated this into my routine, I haven’t broken out even once and for me, that’s huge. My face loves argan oil and basically all Kahina everything. I also use their Facial Cleanser – which is more creamy – after the oil cleanser at night and in the morning. Sahajan Nurture Hair Oil – I recently went blonde after having black hair for years and now my hair loves this oil! I use it as a styling product and it makes my hair so shiny. I’m also obsessed with the way it smells. This line is Ayurvedic and I just feel so good after I use their products, but this a favorite. Kreyol Essence Haitian Black Castor Oil – I was introduced to the founder of this brand and she gave me some products. I have very thin hair and had been using Rogaine but I noticed after using this that my hair seemed to be much thicker and that new “baby hairs” are growing. I have to say that I was amazed by this!! I put it on my scalp and hair a few times a week, usually before I wash it. Dr. Dennis Gross Alpha Beta Peel Pads – They say you can’t shrink your pores but I think Dr. Gross actually can! These things are magic. My skin texture completely changed since I have been using these – it is like a brand new skin! I will never stop using them. Vapour Organic Beauty Atmosphere Foundation – My skin is olive but fair and extremely hard to match. This is a rare perfect match and it makes my skin look so dewy and glowy. I follow it up with Alima Pure Satin Matte Foundation sometimes, which comes in a range of olive shades. Kjaer Weis Eye Shadow in Wisdom – I would love Kjaer Weis products no matter what because the packaging is so cool, but this is my favorite. It’s this kind of purple/taupe/gray color. I get so many compliments when I wear this. I also use it on my brows, which sounds very odd I know, but it works better than anything else I’ve tried. Skandinavisk Hand Cream in Lempi – Skandinavisk is our client, a line of home fragrance from Scandinavia. The scents are so unique, their goal is to capture scents that are unique to their region – for example they have an ocean inspired scent, but it smells like a “cold” island rather than a tropical island. They just launched a hand care collection and the products are super moisturizing. I love the scent Lempi, which means “vintage love” and smells like peony. The packaging is so chic too. I’m all about packaging. Compagnie de Provence Liquid Marseille Soap – speaking of chic packaging, this is the ultimate in chic. I have one by every sink, I love them. They come in glass bottles which you can refill. Marseille soap is also rich in natural oils, so it is nurturing for the hands. I can’t pick a favorite scent but I love the Olive Wood very much. L:A Bruket Salt Scrub – I feel like a lot of people just don’t make salt scrubs anymore? I could be wrong. I just love the big grains of salt! The scent Wild Rose is really nice. L:A Bruket is from Scandinavia too, and the products are super moisturizing like the Skandinavisk ones. Rose fragrances of all kinds – I am a huge perfume fanatic. At one point, I had probably 300 bottles, but I cut back and only have things I really love (which is still quite a few). I was given Delina by Parfums de Marly as a gift last year, which features notes of rose and rhubarb. I normally like smokier, deeper, spicier scents, so it kind of shocked me when I kept reaching for this one. I think I’m into rose all of a sudden. I recently bought Hermes Myrrh Eglantine too – which was an impulse purchase I thought I’d regret – but I’m halfway through the bottle. If I can have a number 11 – it would be H.Gillerman Organics Tension Remedy. This thing is like a cup of coffee – perks you right up and smells amazing. I love all of the H.Gillerman Remedies, I have them all, it is like having your own personal healing chest.